Summary Four bay RAID 5 NAS powered by quad-core Intel Celeron J3455 processor. Optional 10 GbE support via PCIe card. My recent review of the TS-431X, found a relatively inexpensive NAS, but with a built-in SFP+ 10 GbE port. In this review, we'll be moving up a class to the TS-453B-4G, a four-bay NAS in QNAP's middle-range SMB family. The 453B shares that category with the TS-453A, which we haven't reviewed, along with the five bay TS-563 that we did. It's not clear whether QNAP plans to replace the TS-453A with the TS-453B; there are some differences that might justify keeping the TS-453A around for awhile. One reason is the TS-453A has specs similar to the TS-453B's, but is currently $140 cheaper on Amazon. The TS453B is available in two models: TS-453B-4G with 4 GB of RAM installed and the TS-453-8G with 8 GB installed. QNAP supplied the TS-453-4G for our review. The TS-453B has a fresh new look. Rather than having exposed drive bays found on most QNAP NASes, the TS-453B has a front panel that covers access to the drives. 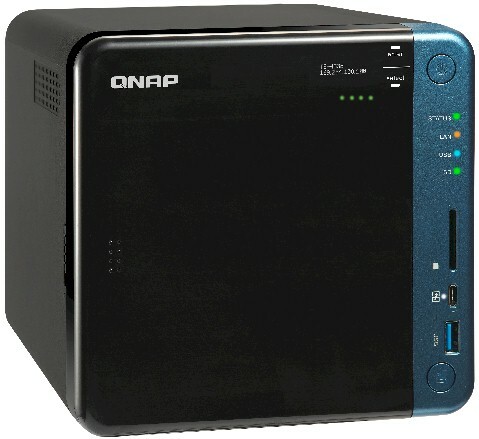 At first glance, it looks more like a Synology product than a QNAP. It features an OLED display rather than an LCD panel and has capacitive touch buttons. With a built-in PCIe slot, the TS-453B has a number of upgrade options. There's a two-port USB3.1 expansion card, single and dual port 10 GbE network expansion cards, and the QM2 combo expansion card consisting of a single 10 GbE port along with support for two M2 SSDs. The PCIe slot also supports a number of TP-LINK's wireless cards which, in conjunction with the QNAP's WirelessAP Station app, can make your NAS do double duty as an AP. This review will compare the TS-453B-4G, a quad-core Celeron-based NAS with the previously reviewed TS-431X, an Annapurna-based NAS that's about half of the price of the TS-453B-4G. QNAP also sent a LAN-10G2SF-MLX dual-port 10GbE SFP+ adapter ($399) so we could test 10GbE performance. The chart below compares the major features of the TS-453B and the TS-431X. The feature list is extensive, but I only included the first screen covering the major features. You can see the full comparison here. The callouts below show the front and rear panel of the TS-453B. The front panel features a USB 3.0 Touch copy port used in conjunction with the USB One Touch copy button, a USB QuickAccess port (Type-C) and a USB Quick Access LED. There's also a convenient SD card slot and corresponding LED. The rear panel has two HDMI ports, dual gigabit Ethernet ports, four USB 3.0 ports, a microphone jack and a speaker jack. Clearly, the TS-453B was designed with home theaters in mind. QNAP even throws in an IR remote. The table below summarizes the key components for the two NASes that we'll be using for our comparisons in the performance section of this review. We didn't open the NAS for board pictures; the information below comes from the datasheet. Power consumption with four SmallNetBuilder-provided WD Red 1TB (WD10EFRX) drives was 28W (active) and 18 W power save. Fan and drive noise was rated as low (mostly drive noise).